Your friends and family will love this delicious bean soup. It's an excellent soup to have simmering on the stovetop or on the wood stove in the fall and winter months. 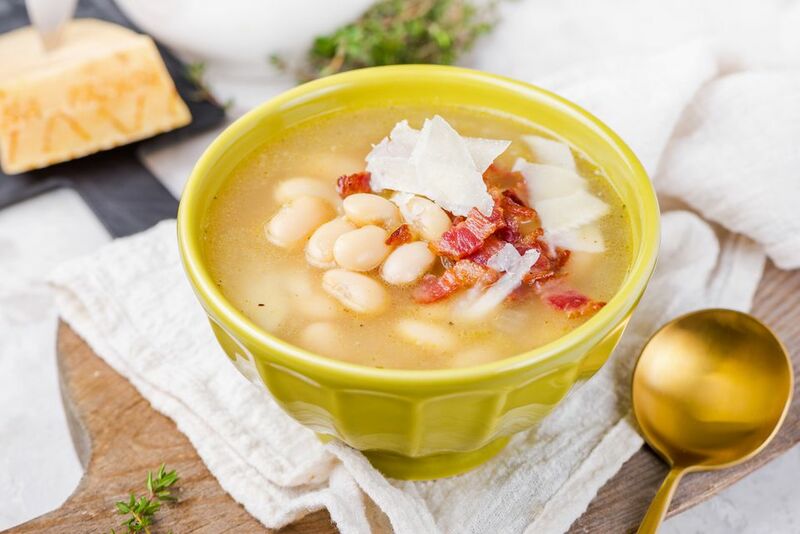 Great northern beans, onion, celery and bacon make a hearty, filling soup perfect for cold weather. Some of the beans are pureed for a thicker soup, but feel free to leave it chunky and rustic. Serve the soup with crusty bread or cornbread for dipping into the soup. Add a salad for a comforting fall or winter dinner. Rinse and pick over the beans. Soak beans overnight in cold water to cover. Cook bacon in a Dutch oven or large saucepan over medium heat until crisp. Remove, drain, and reserve to use as a garnish. Add onion, celery, and garlic to the bacon drippings. Sauté until tender. Add beans, chicken stock, and bay leaf. Simmer until beans are tender, about 2 hours, adding additional water or broth as needed. When beans are tender, remove bay leaf and discard. Puree 1/4 cup of the soup in a food processor or blender, and return to pot. Adjust consistency with more stock or water if necessary. Season with lemon juice, pepper, and salt. Serve the soup garnished with Parmesan cheese and crumbled bacon. If you decide to use a blender to puree the soup, please take ensure that you are using proper safety measures. The steam from hot liquids can cause an explosion in a blender, so use caution when blending hot soup or other liquids. Fill the blender about one-third full, and never more than half full. Loosen the cup in the center of the blender lid. Place a folded kitchen towel over the lid and hold it down firmly while processing.